In prehistoric times mankind's food came from hunting, fishing, and gathering of wild fruits and berries. Cultivation of seeds was discovered about 5000 B.C.E. but there was no way to plow the land since the Iron Age (c. 600 B.C.E. ) had not yet arrived. Various types of water-moving devices have been used since ancient times. 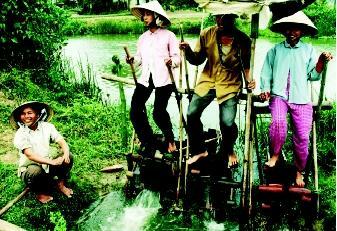 A typical human-powered device, demonstrated here in a Vietnamese rice paddy, is still used today in Asian and some African countries to irrigate small plots. The ancients then discovered that wooden plows could be used in soft soils in deltas of large rivers like the Tigris and Euphrates in Mesopotamia, the Nile in Egypt, the Indus in the Indian subcontinent, and the Yellow in China. Because these are arid areas, water was diverted from the rivers by dams and canals and then raised by human or animal-driven devices that are still in use today. The dams and canals, although crude by modern standards, were beyond the capacity of individual farmers and were built by state-run organizations. Other large-scale works included diking systems to minimize damages from floods. The so-called "hydraulic civilizations" that emerged produced ample food for a growing population but, ultimately, lack of drainage caused buildup of salt and sharp declines in agricultural yields. Over the centuries, along with improvements in methods of cultivation and use of fertilizers, methods evolved for the construction of major works: dams, canals, and pumping units, of ever-larger size. By the end of the twentieth century, the irrigated area in the developed countries reached 50 million hectares (123 million acres), but then limits were reached caused by lack of suitable land and by water scarcity. Such scarcities are occurring in highly developed regions (like California) with no possibility of increasing the usable supply through construction of more dams, because all feasible sites are already utilized. There also is growing competition among users for irrigation, urban use, hydropower , and environmental and wildlife conservation, especially fisheries. To make maximum use of scarce water, sophisticated high-tech devices and procedures have been developed, particularly in the United States, Australia, and Israel. These devices and procedures include laser-controlled land leveling, electronic devices to measure soil moisture, high-pressure sprinklers, and drip systems for vine and tree crops. 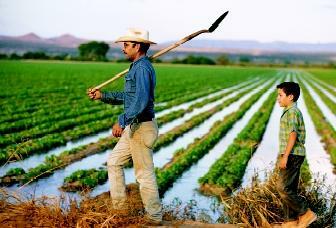 The area under irrigation in the developing countries has reached about 200 million hectares (494 million acres). * There is little potential for increasing this area with the possible exception of parts of Sub-Saharan Africa and Latin America (especially Brazil). Because climates in the developing countries are arid , semiarid , or monsoon-like (rainy for a few months but dry the rest of the year), the only way for these countries to avoid food shortages is to increase the output of lands already irrigated. In all of these countries, the prevalence of small land holdings—often 2 hectares (about 5 acres) or less—is a serious obstacle. Poverty, illiteracy, and the low status of women comprise further obstacles. In some quarters there is optimism that scientists, through biochemical research, will develop new plant varieties through selective plant breeding as part of a new "Green Revolution." However, this idea leads to a complacent attitude that glosses over the reality that the quantity of available water in many regions is reaching a limit. Besides the primary canals, other large-scale works may include dams, major pumping stations, and drainage systems. Agencies that operate and maintain the large-scale works have little interest in operating and maintaining the secondary and tertiary canals and the turnouts. In monsoon climates, the drainage systems may include dikes to protect against flooding from adjacent rivers, and ditches to remove excess water from monsoon rains. In arid climates, dissolved salts in irrigation water gradually accumulate and cause serious damage to sustained agriculture—as occurred in ancient Mesopotamia. Removal of the salts requires flushing with fresh water and removal of the effluent by a drainage system that may be comprised of buried open-jointed pipes, usually of clay, and large-scale works such as ditches (some as much as 10 feet deep) and pumping stations. For systems based on the use of groundwater , similar problems arise. The minimum area served by a shallow well is about 25 hectares (62 acres) involving at least ten or more farmers and even more in the case of deep wells . A small farmer cannot afford to take risks and therefore will insist on growing low-value subsistence (survival) crops like rice, wheat, corn, and root crops, rather than high-value vegetable, fiber, and fruit crops that consume less water. Extensive networks of water-supply aqueducts and irrigation canals in California make possible the large-scale production of high-value fruit and vegetable crops. If developed countries would open their markets to high-value crops from developing countries, poor farmers in these developing countries would be greatly assisted in escaping from the vicious circle of poverty in which they are caught. The elimination of poverty, now recognized as a primary global objective, requires a comprehensive approach to rural development that takes into account not only water but also requirements for rural roads, health services, schools, and small loans for seeds, fertilizers, and pesticides . To overcome the problem of small land holdings in developing countries, Water User Associations (WUAs) have been established to facilitate water distribution and at the same time mobilize local farmers for maintenance of the tertiary and secondary systems. Along with the WUAs, pilot areas have been established to demonstrate to farmers how best to irrigate, how to conserve water, and what techniques to use when higher value crops are grown. If a particular WUA is successful in distributing water in a sustainable manner, it can aspire to become a Rural Development Unit (RDU) that would provide for further needs other than water, leading to a level of development that will in time eliminate poverty. Typically, a WUA encompasses several villages. Village leaders can, and do, seek help from higher levels of government but need assistance from persons with management skills that are acquainted with the local culture. Some such assistance has been provided by Peace Corps volunteers and staff of some of the nongovernmental organizations that sometimes live in or spend time in the local villages of concern. The setting up of WUAs, pilot areas, and RDUs involves government entities at national, regional, and local levels that do not always function harmoniously. Results thus far have been mixed (often poor) where tried in various countries, especially India and Pakistan. Utilization of high-tech devices and procedures in developing countries has been minimal. There is hope that as the WUAs gain experience and knowledge, the use of high-tech will increase. 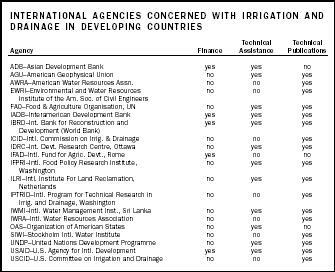 A partial list of the numerous international agencies that are aware of these problems and eager to help is shown in the table. In addition, there are over fifty nongovernmental organizations that have assumed important roles at the vital grassroots (local) level. Although providing much valuable help, the international agencies have been criticized for not acting in a coordinated manner and for not carrying out actions quickly enough. A prestigious international Earth Summit conference held March 2000 at The Hague (Netherlands) presented a "World Water Vision." A group representing nongovernmental organizations and trade union groups expressed serious concerns about the process and the actions carried out to date, and asked that precise targets including funding be established before the next Earth Summit in Johannesburg, South Africa in 2002. However, following that conference, critics voiced similar concerns, particularly with respect to vagueness regarding the sources of the huge investments required. It remains to be seen whether world leaders will face this issue squarely before the next Earth Summit in 2004. Another group called "The Next Generation of Water Leaders" questioned the World Water Vision's strong advocacy for privatization of water systems. The group argued that integrated water management is far more complex than managing a typical private-sector enterprise, and that getting small, rural landholders to pay for water on a volume basis—needed for cost pricing under privatization to be effective—generally is not practicable. As in the case of climate change due to global warming, a consensus is growing that the output of irrigated agriculture in the developing countries must be increased despite threats posed by water scarcity. A concurrent objective should be to reduce the extent of poverty in the world by increasing rural incomes and their equitable distribution without endangering the environment. SEE ALSO Agriculture, Water and ; Food Security ; Integrated Water Resources Management ; Irrigation Systems, Ancient ; Population and Water Resources ; Privatization of Water Management ; Pumps, Modern ; Pumps, Traditional ; Uses of Water . Faruqui, Naser, and Odeh Al-Jayyousi, eds. "Reflections on the World Water Vision by the Next Generation of Water Leaders." Water International 25(2) (2000): 303–311. Discussion by Kirpich, Phillip Z., in Water International 26(1) (March 2001):140–142. Hargreaves, George H., and Gary P. Merkley. Irrigation Fundamentals. Highlands Ranch, CO: Water Resources Publications, 1998. Kirpich, Phillip Z. Water International 25 (2000):488–491. Comments on "Water Crises–Current Perceptions and Future Realities," by Asit K. Biswas, 24 no. 4, 391–394. Merrey, D. J., Tushaar Shah, and Douglas Vermillion. "Institutional Requirements for Effective Water Management." in UNESCO Encyclopedia of Life Support Systems. Paris, France: United Nations Educational, Scientific and Cultural Organization, 2001. * See "Food Security" for a pie chart showing irrigated land areas in the world.